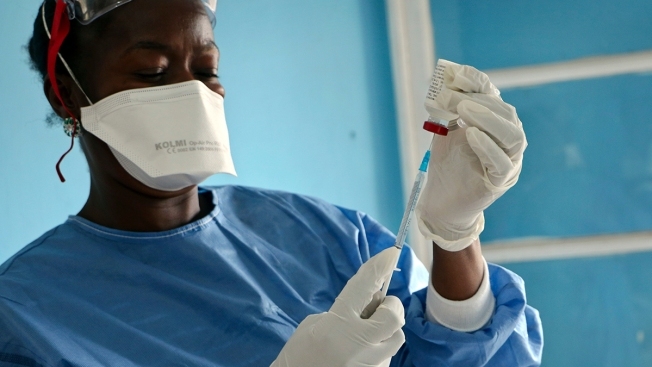 In this file photo taken Wednesday, May 30, 2018, a healthcare worker from the World Health Organization prepares vaccines to give to front-line aid workers, in Mbandaka, Congo. Congo's health ministry says at least four new cases of Ebola have emerged in the country's east, just a week after an outbreak in the northwest was declared over. The ministry says there is no indication the two epidemics separated by more than 2,500 kilometers (1,553 miles) are related. The North Kivu health division notified the ministry on Saturday of 26 cases of hemorrhagic fever, including 20 deaths in North Kivu province. The ministry says four of six samples sent to the capital for analysis came back positive for Ebola. The new cases are in eastern Mabalako health zone within the Beni region. Congo on July 24 declared the end of an Ebola outbreak that began in May in northwest Equateur province. Those 54 Ebola cases included 33 deaths.